For the 24th season of our Chautauqua living history series, Seeking Justice, we commemorated three Americans with a commitment to justice. 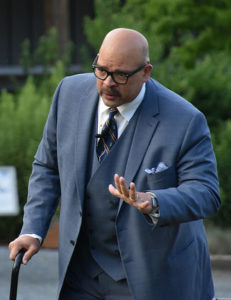 Communications Specialist Sarah Weissman interviewed Brian Anthony Wilson, the Chautauqua actor who portrayed Thurgood Marshall, for his reflections on his first time as a Chautauquan and his experience portraying Marshall. Actor Brian Anthony Wilson, probably most familiar to audiences for guest starring as Detective Vernon Holley in all five seasons of The Wire, calls playing first African American Supreme Court Justice Thurgood Marshall “the biggest challenge of my thirty-five-year theatre career.” Wilson played Marshall in the George Stevens, Jr. play Thurgood at Olney Theatre Center last summer. He reprised his role in an excerpt from the one-man show for this year’s Chautauqua series. In a different format for the Maryland Humanities program, a dialogue with scholar Dr. Lenneal Henderson followed the performance. Critics who reviewed Thurgood at Olney said that Wilson brings an “imposing physique, sonorous voice and disarming demeanor to the assignment,” or call the actor and the man he portrays “beautifully paired.” When reading the reviews, the challenges Wilson faced in rehearsal may come as a surprise.